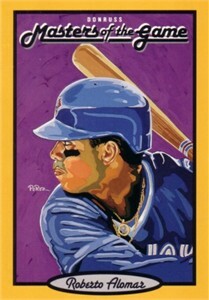 1993 Donruss Masters of the Game 3 1/2 by 5 inch jumbo card of former Toronto Blue Jays superstar Roberto Alomar. NrMt-Mt. ONLY ONE AVAILABLE FOR SALE.